When most Giants fans think about a kicker making a clutch kick in a pressure situation, they most likely recall Matt Bahr or Lawrence Tynes kicking the Giants to the Super Bowl. There was a time when the odds would have been against those seemingly effortless kicks being successful. The game of football has evolved most significantly in the way goals are scored from the field. When the American Professional Football Association (APFA) was formed in 1920, the ball was larger and drop kicks were the favored method for field goals, while placements were typical for most points-after–touchdowns. Misses were common though, teams would often make just a few field goals over the course of a season and point-afters were never taken for granted. The players who attempted these kicks did not come in off the bench. They were four-down players who played on both sides of the ball. When an offense was stopped on third down, one of the backs, or even a lineman, dropped back for a punt or field goal attempt. If the field goal was missed, he did not sulk back to the sideline; he lined up in his defensive position and continued to play. 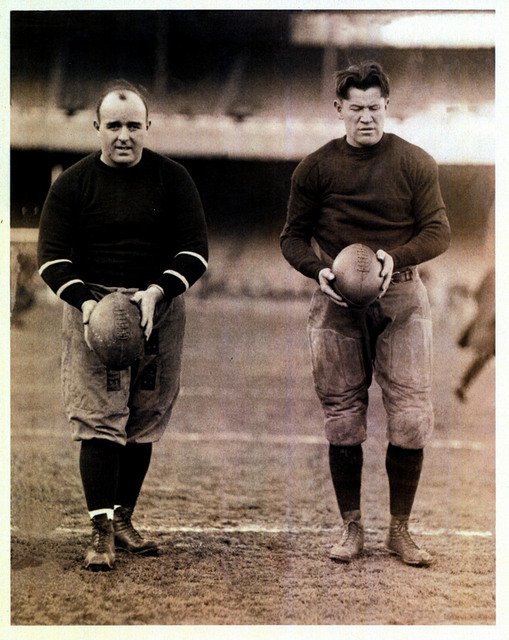 The Giants entered the NFL in 1925 with Jim Thorpe, one of the most famous football players of his day, on the roster. Aside from his exploits as an athletic runner and fierce tackler, Thorpe was a legendary drop kicker. Thorpe’s tenure with the Giants was brief, being aged and out of shape, he lasted only three games before being released. New Yorkers never saw him attempt any of his famous drop kicking exploits in the Giants red and blue. But they were once treated to a drop kicking exhibition between Thorpe, then of the Cleveland Indians, against Charles Brickley of the New York Brickley Giants at the Polo Grounds in December 1921 four years before the NFL’s New York Giants were formed. The occasion marked the first professional football contest in New York City and took place at halftime. Each man was good on six of twelve attempts. Brickley took the honors of the longest successful attempt from an impressive 60-yards out. In the actual game, Thorpe was good on a 40-yard attempt and also drop-kicked a point-after in the Indians’ 17-0 triumph. Unfortunately, the added attraction of Thorpe’s drop kicks was not enough to keep the fledgling New York franchise afloat, and Brickley’s Giants disbanded after the game. The APFA/NFL followed the college football rulebook for its first 12 seasons. In college, placements were required for point-after attempts through 1922. Beginning in 1923, a player could choose between a drop kick or placement attempt. Place kicks could only take place behind the line of scrimmage while a drop kick could take place from anywhere on the field (the NFL abolished this seemingly obsolete rule in 1998.) The ball at this time was much broader around its circumference and closely resembled a rugby ball. This facilitated drop kicking as the ball bounced true as it descended on end to the ground, and also allowed for a greater surface area for contact on the kicking foot. The kicker would either kick the ball with the top of his foot or instep as it hit the ground or just after it bounced. From 1920 through 1926, the goal posts were on the goal line in front of the end zone and there were no in-bounds lines (later known as hash marks) on the field. This combination often caused attempts to be made from wide angles, greatly increasing their difficulty. To help alleviate this, the goal posts were moved to the end line at the back of the end zone in 1927, but the added distance proved to be nothing more than a different challenge. Drop kicking for distance was never an issue, controlling the flight of the ball was the premier challenge. The goal posts themselves had the same dimensions as today. The crossbar was 10 feet above the ground and 18 feet, four inches in width. Missed field goals resulted in the defensive team taking over possession of the ball on the 20-yard line, regardless of where the ball was kicked or the previous line of scrimmage (essentially a touchback.) Kickoffs were off a tee from the 40-yard line. The record for the longest drop kick field goal is 45 yards by the Canton Bulldogs’ Wilbur “Pete” Henry, who connected on two in a game against the Toledo Maroons on December 19, 1922. However, there are three unofficial 50-yard drop kicks that remain off the books because they could not be verified. The first was by Henry in November 1922. Then John “Paddy” Driscoll of the Chicago Cardinals had one in September 1924 and another in November 1925. Henry’s official record of 45 yards remained the longest successful kick of any kind in professional football for 12 years. The very first points in New York Football Giants history (the Giants owned by Tim Mara) came via a drop kick field goal off the foot of Matt Brennan on October 15, 1925 at Frankford Stadium. The 15-yard kick gave the Giants a 3-2 second quarter lead over the Yellowjackets, but the Giants went on to lose 5-3. The next day at the Polo Grounds, Thorpe missed a 48-yard drop kick field goal in the third quarter of a 14-0 loss to the Yellowjackets. Thorpe was released later in the week and then played two games with the Rock Island Independents where he failed to register any points. 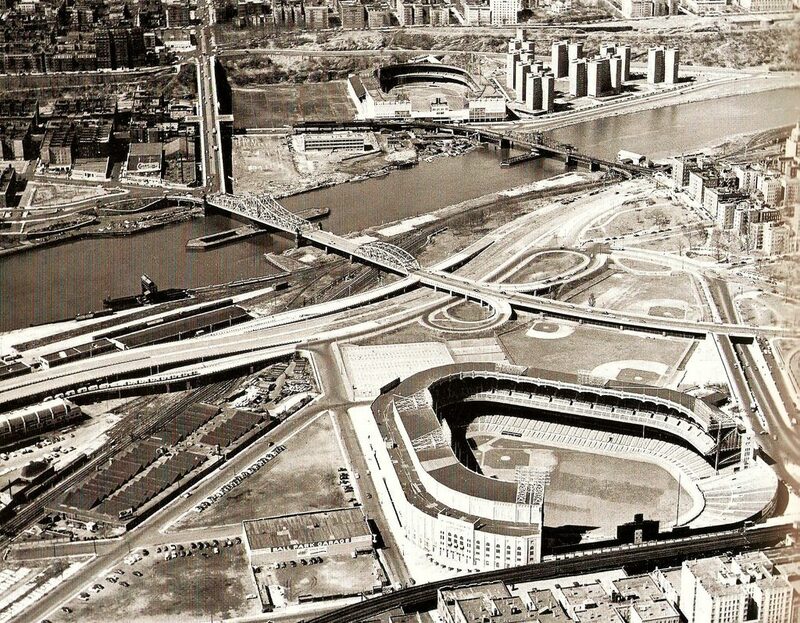 The Giants first win came two weeks later, a 19-0 triumph at the Polo Grounds over the Cleveland Bulldogs. Dutch Hendrian registered the first successful point-after for New York, a second quarter drop kick. This was somewhat unique in that most point-after attempts were from placement, a tendency that endured from the early college rules. 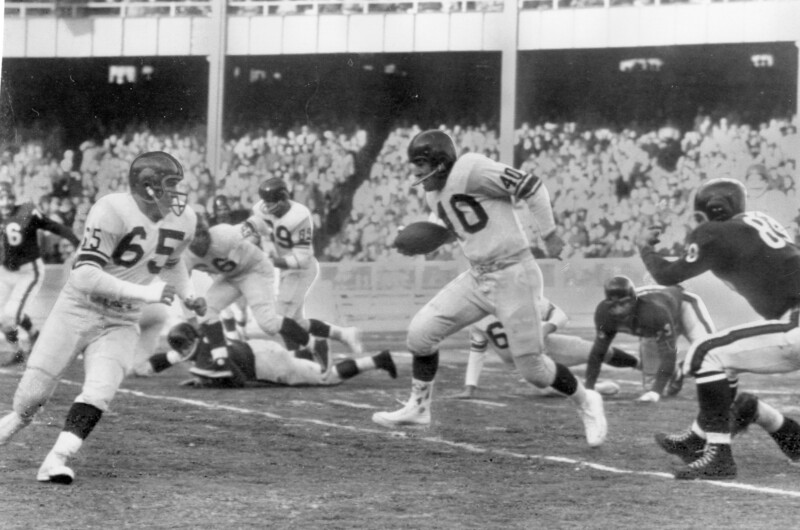 Hendrian had the first multi-field goal game for the Giants on November 11 versus the Rochester Jeffersons at the Polo Grounds. He drop-kicked two goals over in the first half from 35 and 25 yards out. The Giants fielded a competitive team their inaugural season, and finished fourth overall with an 8-4 record. As was the case with most teams, the kicking duties were handled by a group of players. Small rosters and restricted substitution demanded versatility by all team members; specialized talents were a luxury decades in the future. The more a player could do well, the more valuable he was to his team. The most valuable player of the 1925 Giants was fullback Jack McBride. Although official statistics were not recorded until 1932, game accounts indicate McBride was usually New York’s leading passer, and either first or second in rushing along with fleet- footed halfback Hinkey Haines. McBride handled the bulk of the Giants kicking. 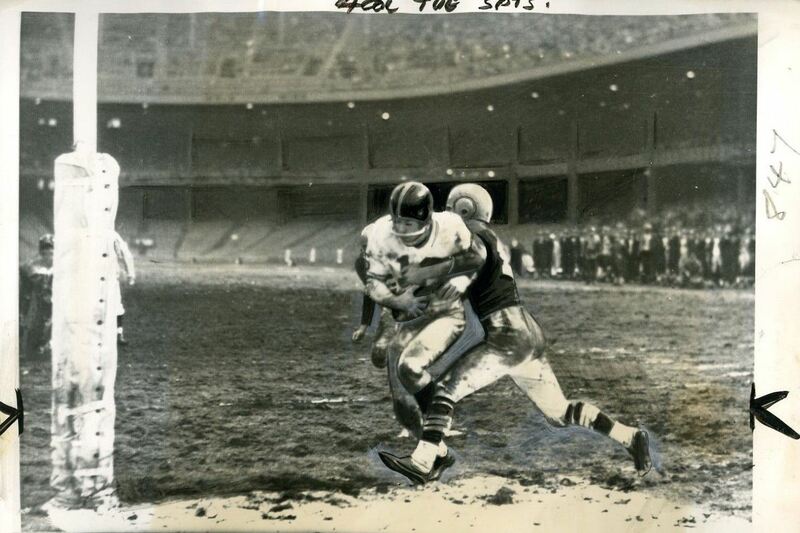 His point-after in the 7-0 win over the Buffalo Bisons on November 3 at the Polo Grounds was the first successful placement for the Giants, and his 30-yard field goal versus the Dayton Triangles on November 29 was New York’s first placement from the field. McBride led the Giants with seven point-after conversions during their inaugural season. The early part of the 1926 season highlighted how no kicks, whether dropped or placed, were ever sure things during this era. The season opener saw McBride good on two placement point-afters and Paul Hogan good on a drop kick point-after in a 21-0 win at the Hartford Blues on September 26. The Giants 7-6 win the following week at Providence on October 3 versus the Steamroller was preserved by a blocked drop kick point-after attempt in the third quarter. New York suffered back-to-back 6-0 losses to Frankford on October 16 and 17 that featured 42- and 32-yard placement field goals by Johnny Budd at Frankford Field, but the next day at the Polo Grounds he failed on his point-after try. The early NFL record for consecutive point-afters made was by Henry, who converted 49 straight attempts from 1920 through 1928 while playing for three teams that included a brief tenure with the Giants in 1927, although he did not register a kick while with New York. The second longest streak was 26 straight by Elmer Oliphant of the Buffalo All-Americans in 1921. Although McBride never had a streak approaching those two, he did convert 15 point after placements during the 1926 season while Hogan drop-kicked three more. McBride also converted New York’s only field goal, a 25-yard placement at Ebbets Field against the Brooklion Horsemen – an amalgam of the NFL’s Brooklyn Lions and the AFL’s Brooklyn Horsemen – on November 25. The shape of the ball gradually changed over the course of the decade. Drop kicks became increasingly rare as the circumference of the ball narrowed to facilitate the nascent passing game. The college football rulebook listed a circumference around the middle of 22.5 inches and 23 inches in length for 1928. The size was reduced to 22 inches around the middle and 22.5 inches in length in 1931. This change greatly impacted drop kicking as the end became more pointed. Not only was the required true bounce more difficult to obtain, the spin of the ball coming off the foot changed, which negatively impacted accuracy. McBride handled the bulk of the kicking chores for New York the next two seasons. The Giants lone field goal in 1928 was Bruce Caldwell’s drop kick on October 28 at Yankee Stadium, providing the margin of victory in a 10-7 decision over the rival New York Yankees. The most sought after players in the single platoon era were known as Triple Threats, a player who could run, pass and kick (tackling on defense was a given, calling them a quadruple threat would’ve been redundant.) Two players who fit this rare mold were fullback Ernie Nevers and tailback Benny Friedman. 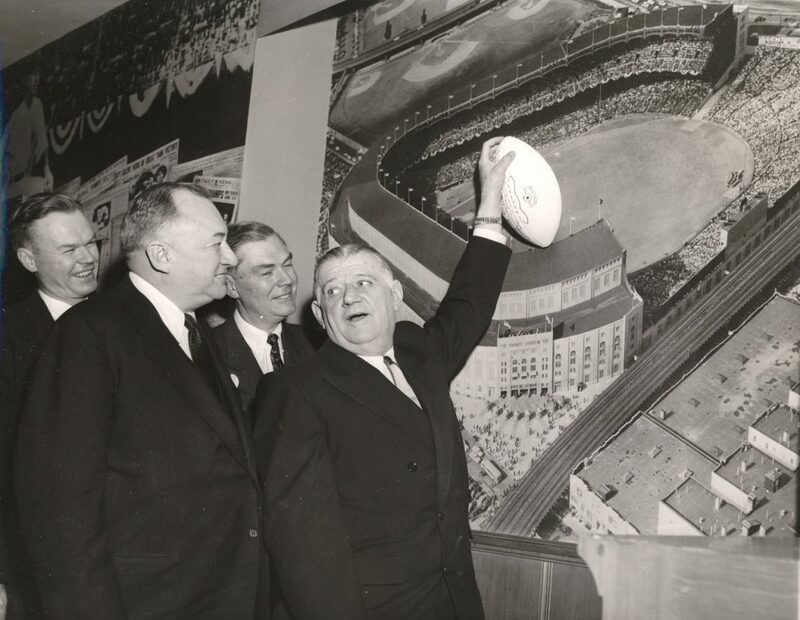 The Giants obtained Friedman in 1928 when Mara purchased the entire Detroit Wolverines franchise, and immediately installed him as the face of the Football Giants and centerpiece of the team. Friedman was deservedly renowned for his ability to manipulate the bloated ball of its day through the air, but he was the Giants primary kicker as well. He passed for a professional record 20 touchdown passes in 1929, ran for two others and kicked 20 point-afters from placement. 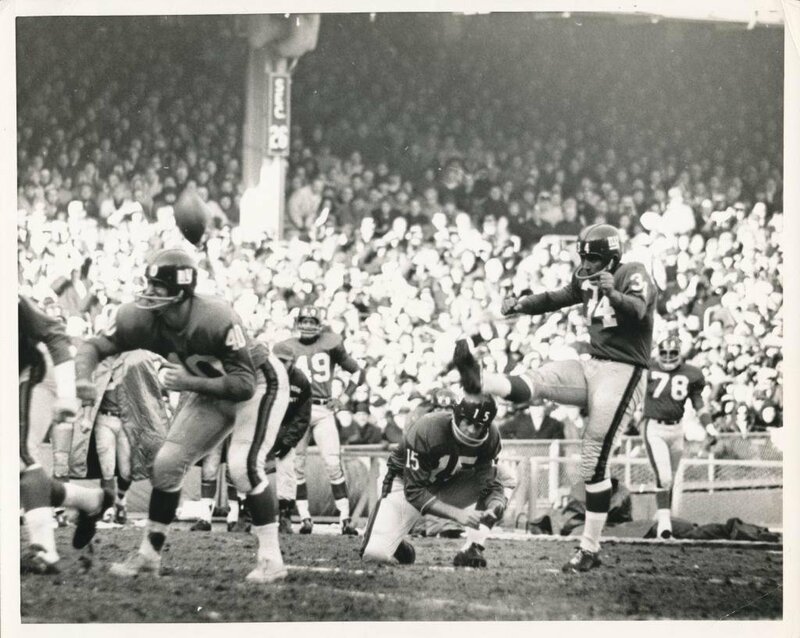 Tony Plansky converted an extra point on November 3 at Wrigley Field against the Chicago Bears, and a drop-kick field goal on December 1 at the Polo Grounds versus Nevers and the Chicago Cardinals. 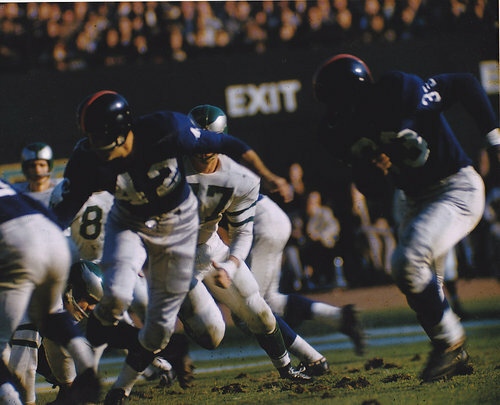 This game at the Polo Grounds took place three days after the oldest record standing in the NFL record book was established. On Thanksgiving Day at Wrigley Field, Nevers ran for six touchdowns, a standard that has been tied twice. The mark that has proved unattainable though was the total points of 40, as Nevers drop kicked four point-afters. He accounted for all the point in the Cardinals 40-6 win over the Bears. Nevers scored two touchdowns and dropped a point over in the game at New York, but Planksy dropped the decisive kick over from 42-yards as time expired for a 24-21 Giants win, and in the process also set the mark for the longest field goal in franchise history at the time. Planksy’s 1929 conversions are the last recorded drop kicks in Giants history. Friedman led New York in point-afters again in 1930, and also registered New York’s only successful field goal of the season. The last minute placement from 42 yards gave the Giants a 9-7 win versus the Stapletons at Staten Island on November 2, and also tied Plansky’s record for length. Friedman suffered a severe knee injury in 1931 and missed the second half of the season. He left the Giants during the off season after a contract dispute to play and coach for the upstart Brooklyn Dodgers. Versatile wingback Hap Moran assumed the role of place kicker for the Giants, leading the team with eight point-afters and the team’s only field goal of 1931. The Giants found another versatile back to help fill the void left by Friedman in 1932, and he was very familiar to the Giants, having lost him in a recruitment competition to Staten Island a few seasons earlier. Ken Strong was a phenomenal talent – he was once compared to Thorpe and Nevers by Grantland Rice – and was one of the last pure Triple Threats. As a whole, New York had a down year in 1932. There were a mere seven point-afters registered on the season and not a single field goal – they were shut out from the scoreboard entirely four times. The NFL created its own rule book in 1933. In addition to relocating the goal posts forward to the goal line, in bounds lines were placed 10 yards in from the sidelines. This assured plays from scrimmage would originate closer to the center of the field and reduced the instances of downs being wasted merely to move the ball away from the boundaries. That season Strong recorded the first free kick field goal in Giants history. 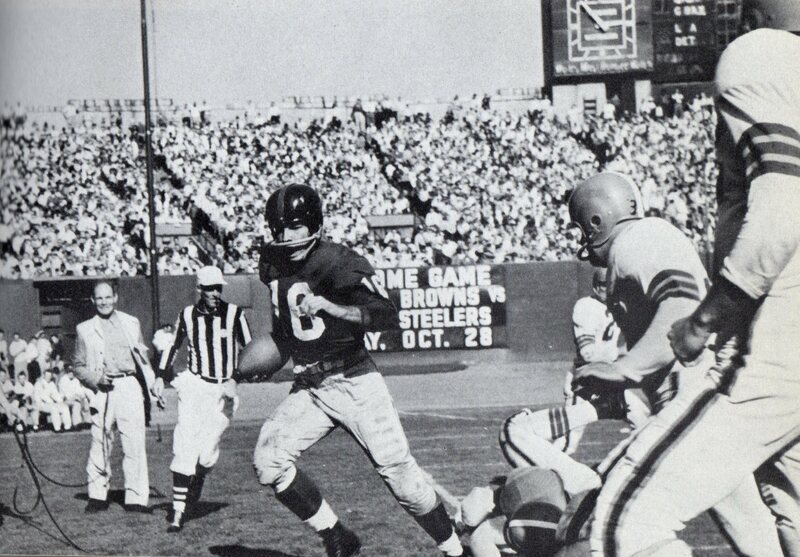 On November 26, at the Polo Grounds against Green Bay, Dale Burnett made a fair catch of a short punt by the Packers on the 30-yard line. Knowing of the rarely-used rule, and unable to resist the opportunity for an uncontested attempt by a skilled kicker, Coach Steve Owen immediately called for a free-kick field goal. Strong’s attempt was true and through the upright, giving the Giants their final points in a 17-6 win. Strong’s kick was believed to be the first-known free-kick field goal for many years until it was recently discovered that George Abramson of the Packers made a 35-yard free-kick field goal at Comiskey Park against the Chicago Cardinals on November 8, 1925. Strong’s kick is now recognized as the second free-kick field goal in NFL history and remains the only one converted in Giants history. In 1934 the ball also shrank to its final dimensions: 21.25 inches in circumference and 21.5 inches in length. This prolate spheroid was aerodynamically designed for passing, and inadvertently caused a significant shift in the kicking game. With drop kicking now all but gone, save for a very few holdovers, the preferred method of place kicking was the straight-ahead approach. This featured similar leg mechanics as the drop kick, and likewise provided comparable accuracy and distance. The major difference between the two methods is that in the placement kick, the foot is pointed upward when contact is made with the ball. In the drop kick, the foot is pointed downward (essentially the same motion and alignment as a punt). Strong, who exclusively placekicked in the NFL but occasionally drop kicked in college, noted his thoughts on the differences between the styles in his 1950 book “Football Kicking Techniques”. He said the shape of the ball was an overrated argument against the drop kick. In fact, he said drop kicking provided the offensive team the advantage of a tenth blocker, who was lost as the holder for placements. Strong said placements were the preferable method in inclement weather. The changes had an impact on the field. The improved distance aspect was proven without a doubt on October 7, 1934 when Detroit’s Glenn Presnell set the NFL’s new distance record with a 54-yard field goal in a 3-0 win at Green Bay’s City Stadium. He led the NFL with 13 point-afters and 64 total points (boosted by five touch downs) that season. New York tailback Harry Newman shared the kicking responsibilities with Strong for two seasons, and set a team record that would stand for nearly 30 years when he connected on three field goal attempts at Fenway Park against the Boston Redskins on October 7. Newman’s performance was clutch as well. He tied the game 13-13 early in the fourth quarter, and then sent the winner through with less than four minutes to play for the Giants 16-13 victory. 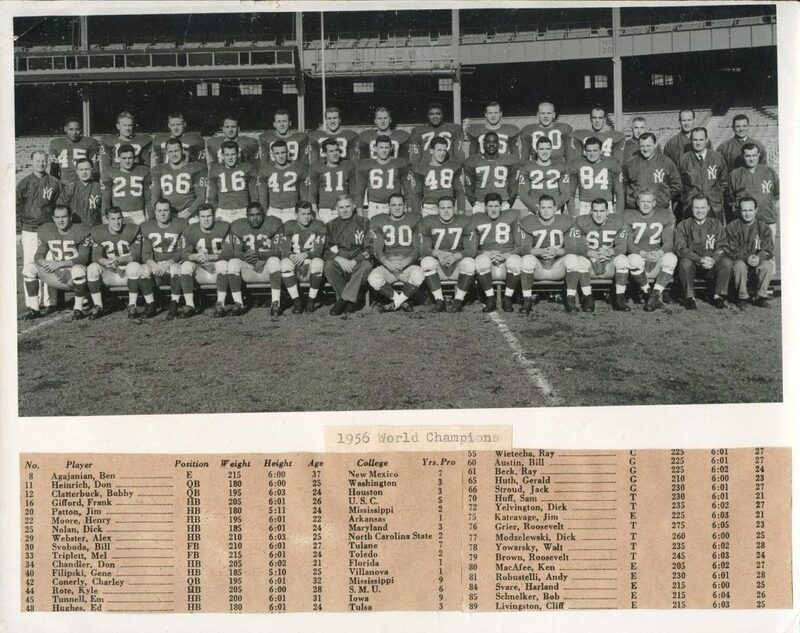 Strong reset New York’s longest field goal standard by two yards on October 21 in a 17-7 win over the Pittsburgh Pirates at the Polo Grounds with a 44-yard placement. However, his signature performance came two months later in the NFL Championship Game on December 2. 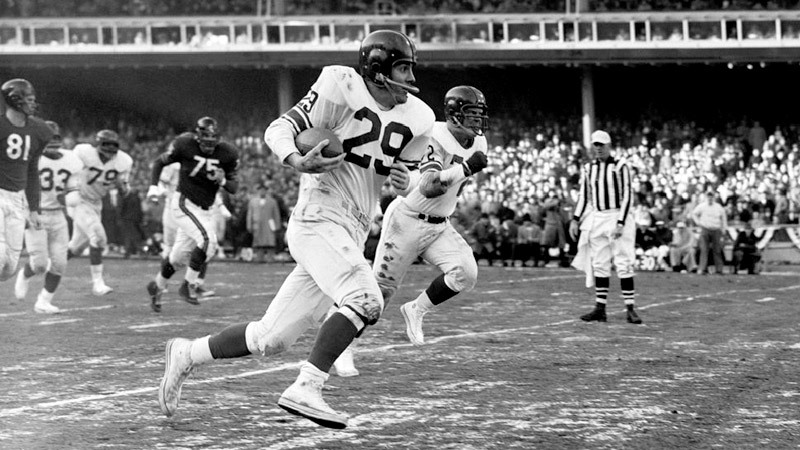 Strong’s 17 points (two touchdowns, two point-afters and a field goal) were a critical factor in the Giants upset of the 13-0 Bears for the Giants second NFL title, and was the franchise post-season standard for 69 years. Strong did the Bears in again the following season. In the middle of the third quarter at a rainy Wrigley Field, New York and Chicago were tied 0-0. Strong exhibited composure repeatedly under challenging circumstances, while also nursing a separated shoulder. The Giants mustered a drive on the sloppy field, but stalled at the Chicago 15-yard line. Strong’s initial field goal attempt from 22 yards hit the left upright, but the Bears jumped offside and the Giants received a new set of downs on the 10-yard line. 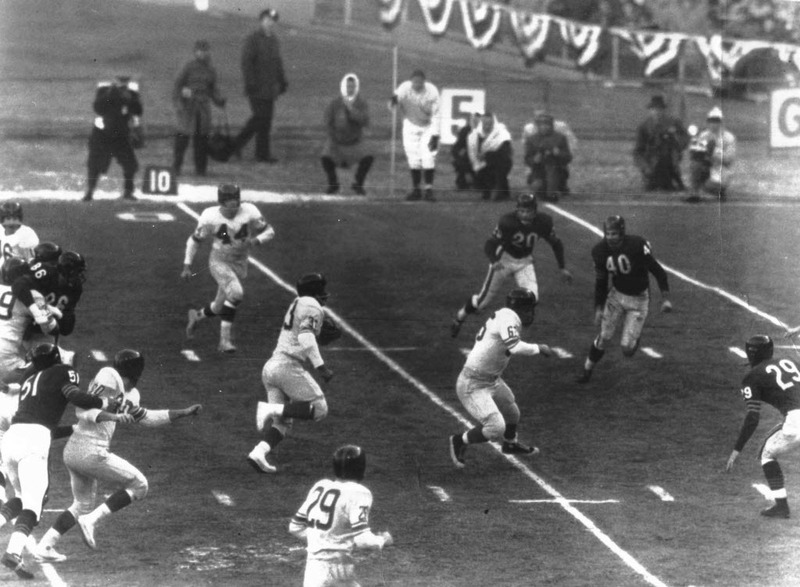 The Chicago Daily Tribune described the sequence that began with a fourth-and-goal from the six: “Strong went back to the 14-yard line and made a place kick, but both lines jumped offside and the field goal did not count. Strong again stood on the 14 and kicked. Both sides were again offside and his perfect placement was wasted. On the next attempt Strong barely got the ball over the bar. 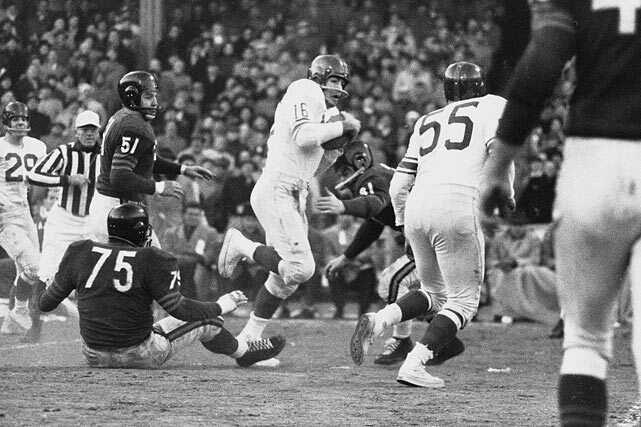 His teammates had been considerate enough to stay onside this time, however, although the Bears were pushing them around when the ball was snapped.” Once in the lead, Giants head Coach Steve Owen depended on Strong’s leg for punting, as the Giants engaged in a field position battle with Chicago and prevailed 3-0. Most surprisingly, Strong outdueled the NFL’s most highly regarded kicker of the time, “Automatic” Jack Manders, who missed all three of his field goal attempts. 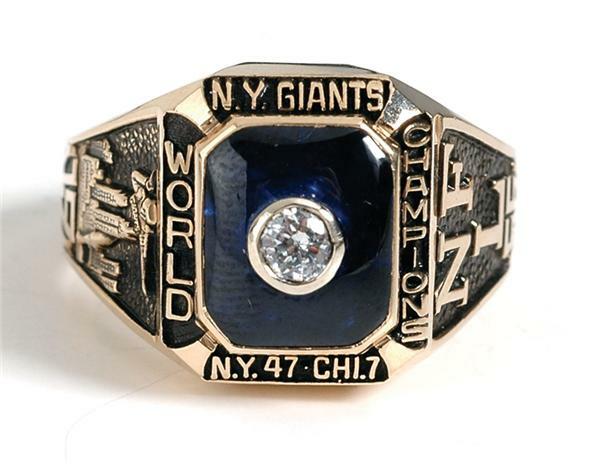 After the 1935 season, Strong left the Giants for the New York Yankees of the new rival AFL. During that period, with their own kicking situation in flux, the Giants were victimized by one of the all-time great drop-kickers, Earl “Dutch” Clark. On November 18, 1936 at the University of Detroit Stadium, Clark drop-kicked a field goal and three point-afters in the 38-0 Lions victory. These were the last successful drop kicks against the Giants in the regular season. Tillie Manton was one of three New York players to kick field goals in 1937. The one he made on September 26, 1937 at Forbes Field ranks among the highest in degree of difficulty in team history. In the middle of the fourth quarter of a 7-7 game, the Giants embarked on a 68-yard drive that stalled on Pittsburgh’s 5-yard line. The ball was set for play on the in-bounds line, which were only 15-yards in from the sideline. On third down New York attempted a play to move the ball toward the center of the field, but the Pirates overloaded their defense and forced a field goal attempt at an acute angle, as the goal posts were located on the goal line. The New York Times game summary described the situation: “Manton had to try for his winning field goal from far over on the side of the field. Had it been much farther over, Tillie would have had to boot from the Pittsburgh bench. The angle was simply horrible, and when the Giants craftily went off side to lessen the angle by bringing the ball back, Pittsburgh just as craftily refused to accept the penalty. The Manton kick had to be perfect and straight as a die to click. Fortunately it was.” This impressive kick would be New York’s last fourth quarter game winner for 13 seasons. Ultimately, the heir apparent to Strong proved to be another multi-talented back. 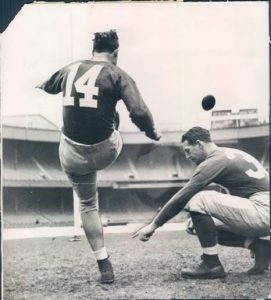 Ward Cuff came to the Giants in 1937 with no prior kicking experience, but he was tutored personally by Owen. Cuff only kicked two field goals his rookie season while he fine-tuned his new skill. A milestone was set by a member of the old guard that year. On September 19 Detroit’s Clark made the last recorded drop kick field goal in professional football history – a 17-yard attempt in the second quarter of a 16-7 win over the Cardinals. Cuff assumed the role as the Giants primary kicker in 1938, and he led the league with five field goals and 19 point-afters as the Giants won the Eastern Division title. 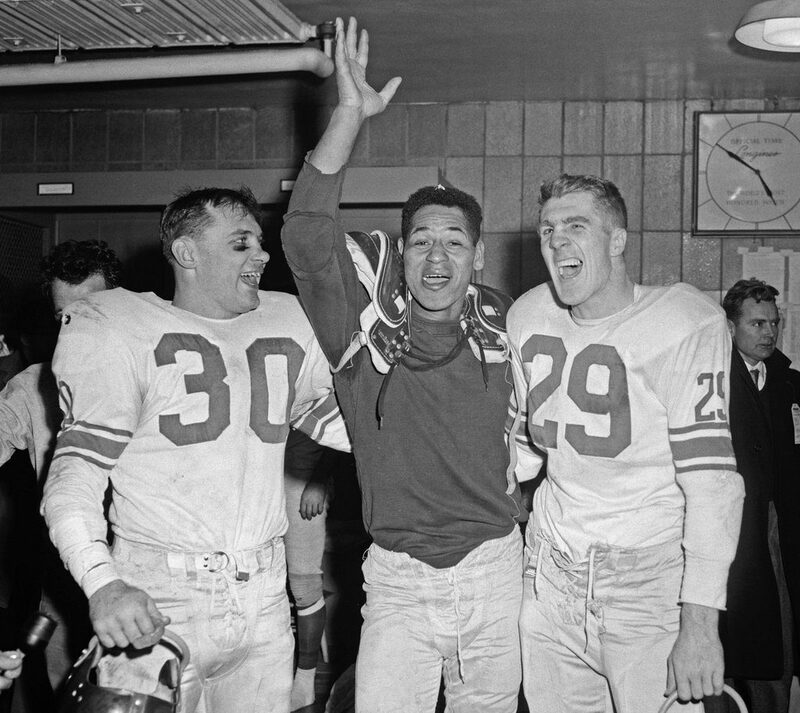 His two field goals and two point-afters provided the edge as the Giants won their third overall championship, and became the first team two win two NFL Championship games, 23-17 over Green Bay in a hard fought contest. 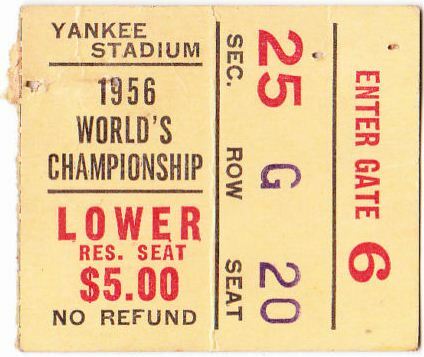 Cuff’s biggest day took place at the Polo Grounds on October 22 in front of the second-largest crowd in pro football history at the time. He was three-for-three on field goals and added a point-after, to give the Giants a seemingly comfortable 16-0 fourth quarter advantage over the Bears. 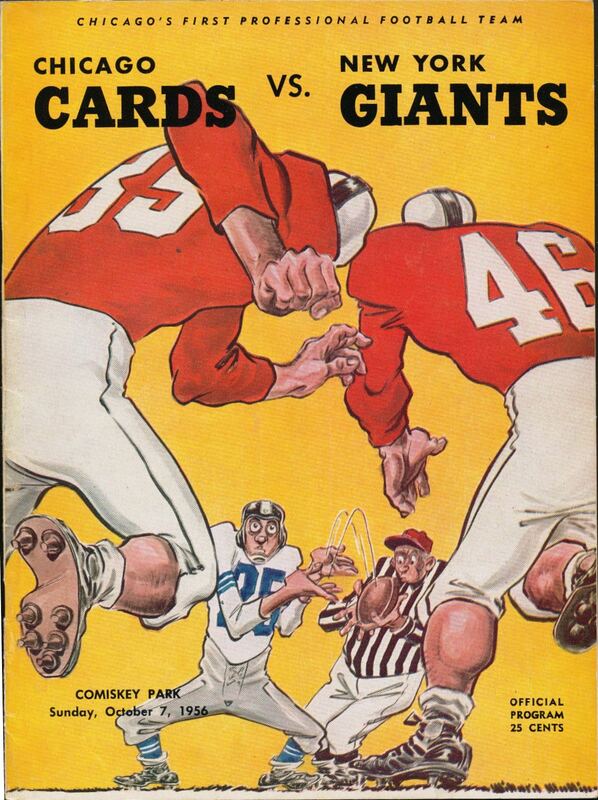 However, Sid Luckman shredded the Giants normally stout defense. Nevertheless, while Chicago scored two quick touchdowns on only four plays, the Giants held on for the 16-13 win. The new mark for the Giants longest field goal surprisingly came off the foot of Len Barnum. His 47-yard kick at the Polo Grounds against the Cardinals on November 11 eclipsed the standard twice set by Strong in 1934 and 1935 by three yards, and was the longest kick in the NFL in 1939. The NFL’s final successful drop-kick took place in the NFL Championship Game at Wrigley field on December 21. Ray McLean of the Bears tallied Chicago’s final point in a 37-9 win over the Giants when he drop-kicked the point after. The last drop-kick in pro football until the 2005 season took place on November 28, 1948 in the All-America Football Conference (AAFC), but it was not by design. San Francisco’s Joe Vetrano lined up for a placement point-after in Kezar Stadium against Cleveland. The snap was low and the holder lost control of the ball. Amid the chaos, Vetrano scooped the ball, evaded the rush and successfully drop-kicked the ball through the uprights, a magnificent ad-lib performance. Owen and the Giants took advantage of the war era’s relaxed substitution rules and lured Strong out of retirement in time for the 1944 season. It proved to be a fortuitous move for both sides. Strong led the NFL in field goals and the Giants won the Eastern Conference. Perhaps to underscore his intended role as a specialist, Strong insisted on not wearing shoulder pads or a helmet during games. Strong set the franchise record for point-afters with 32 in 1946 as the Giants again won the Eastern Conference. Strong retired for good after the 1947 season. Over the course of his final four seasons as a kicking specialist, he converted 102 of 104 point-after attempts in an era when misses were still commonplace. 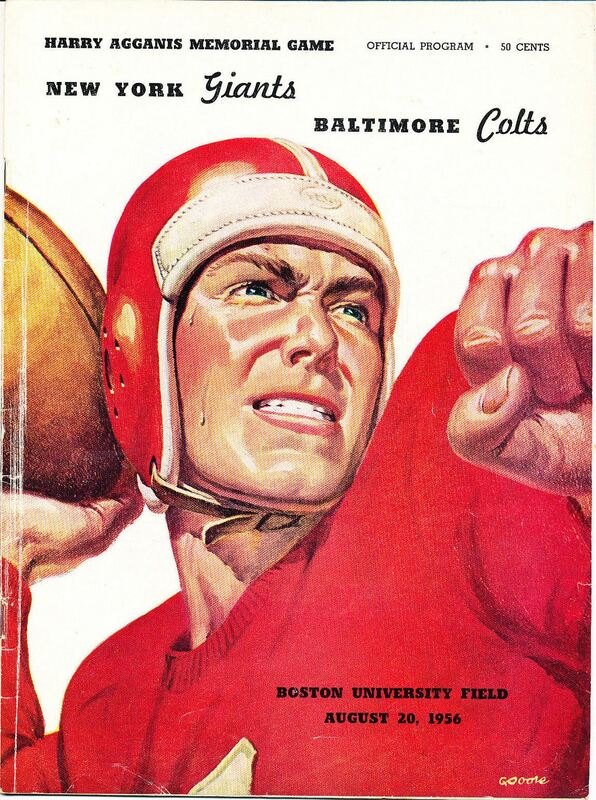 Strong’s #50 was retired in 1947 and he was enshrined in the Pro Football Hall of Fame in 1967. On October 7, 1945, a record that may prove unbreakable was set by Green Bay’s Don Hutson. In the second quarter of a game against Detroit at the Wisconsin State Fair Grounds, Hutson caught four touchdown passes and kicked five point-afters. The record 29 total points scored in one quarter still stands today. Hutson added two more point afters in the second half, bringing his total to 31 points on the day, which at the time was the second most points scored by an individual in a game after Never’s 40 point game. Len Younce, an All-Pro tackle, was New York’s primary kicker in 1948. He struggled on field goals, converting just one of seven, but was 36 for 37 on point-afters which broke Strong’s record. Looking to improve in the field goal department, a unique specialist joined the Giants in 1949. “The Toeless Wonder” Ben Agajanian is one of the most unique and influential kickers in pro football history. After losing four toes on his right foot in an elevator accident when he was in college, Agajanian had a cobbler fabricate a squared-off cleat for kicking. This actually may have provided an advantage for him as with the straight-ahead style he was able to get more surface area of his kicking foot onto the ball than other kickers. Agajanian broke his arm in a 1945 preseason game with Pittsburgh and became a kicking specialist for the remainder of his career. He spent two seasons with the Los Angeles Dons of the AAFC before joining the 1949 Giants. Agajanian had an excellent first season in New York. He set the Giants field goal record with eight, and his 35 point-afters were just one short of tying Younce’s 36 from the previous season. However, he was released after the season. A kicking specialist was considered an impractical luxury on a 32-man roster. Versatility was still the rule of the day. End Ray Poole filled the role capably for the next three seasons. Being a lineman, he had good range off his strong right leg, but he endured accuracy issues his first season. He did, however, prove himself to be reliable under pressure. 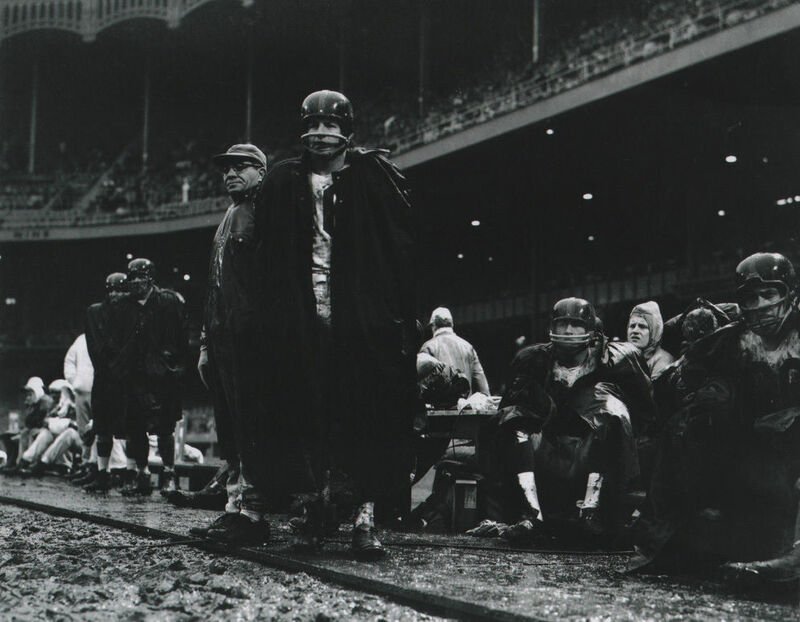 On November 5, 1950, Poole capped off a furious come-from-behind effort at the Polo Grounds against Washington. New York trailed 21-14 late in the fourth quarter when they mounted an 89-yard march to a touchdown. Poole’s point-after tied the game at 21-21 with two minutes to play. Poole kicked off, and the Redskins made an ill-fated attempt at a razzle-dazzle play. Tom Landry intercepted a lateral following a pass completion on the Washington 41-yard line. Charlie Conerly completed a pass to the 33-yard line and Poole made the winning kick from 40 yards with four seconds on the clock. Poole’s field goal accuracy greatly improved in 1951 and the Giants reaped the benefits. He established the new team mark for field goals in a season with 12, while tying the record for three field goals in a game twice during the season, and a third time in 1952 before retiring. New York’s kicking duties in 1953 were shared by multi-purpose backs Randy Clay and Frank Gifford, who combined to covert three of 12 field goal attempts. A new coaching staff, headed by Jim Lee Howell, and rosters expanding to 33 created another opportunity for the specialist Agajanian, who had returned from retirement to kick for the Los Angeles Rams in 1953. During that season, Baltimore Colts Bert Rechichar set a new record for field goal length when he connected on a 56-yarder at Memorial Stadium against the Bears. Agajanian seemed determined to redefine exactly what it meant to be a specialist. He maintained a house in California and wanted to be with his family and keep an eye on his private business interests as much as possible. Agajanian proposed to Howell that as a pure kicker he did not need to be present for the full week of practice. Howell complied, and Agajanian flew home on Sunday nights and returned to New York on Thursdays throughout the regular season. No one had ever seen anyone as meticulous with his craft as Agajanian, which is probably why he was befriended by the analytical Landry. Agajanian broke down every aspect of kicking to a science. He was the first to insist the center snap the ball to the holder with the laces facing forward, even noting the number of revolutions the ball should make during its flight. He instructed holders on how to simultaneously turn the ball as they set it to the ground, straight up-and-down. Agajanian would only have the holder set the ball on an angle if there was a strong wind. 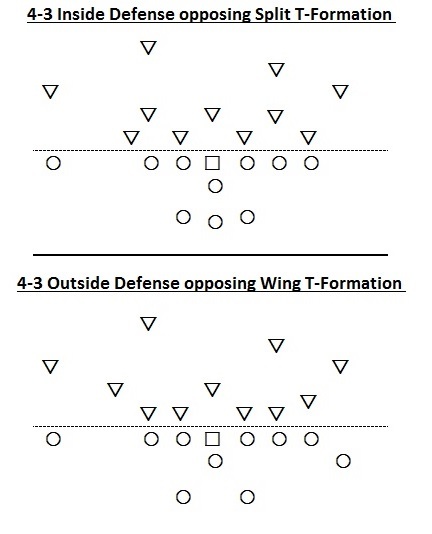 He also designed the bowed-line formation, with the outside blockers at the wing position, to kick-protect. Later, during his 24-year career as a kicking coach, Agajanian would develop the three-steps-back, two-steps-to-the-side set for the sidewinder approach to the ball. Landry said Agajanian did more to advance kicking than any other individual in history. The acquisition of Agajanian in 1954 paid immediate dividends for New York. 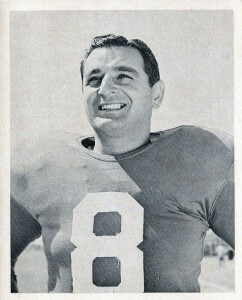 Agajanian advanced the Giants single-season field goal record to 13, and he twice kicked three in a game. Prior to the 1956 season, team management became disenchanted with his absence during the week and rescinded his traveling privileges. Agajanian retired from kicking, but agreed to coach his potential replacements Gifford and rookie punter Don Chandler during training camp. 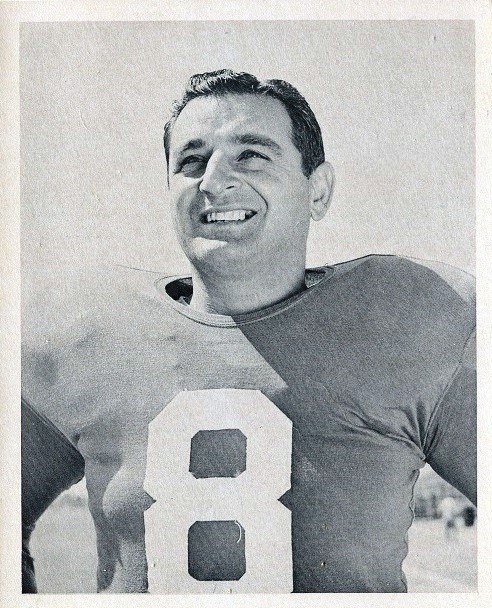 They struggled with the additional responsibilities during the first three weeks of the regular season and the Giants acquiesced on Agajanian’s demands and brought him back to New York. Not only did Agajanian retain his special dispensation to leave for the West Coast during the week, but he was reprieved during games as well. Chandler continued to handle kickoffs, as he possessed had a powerful leg. 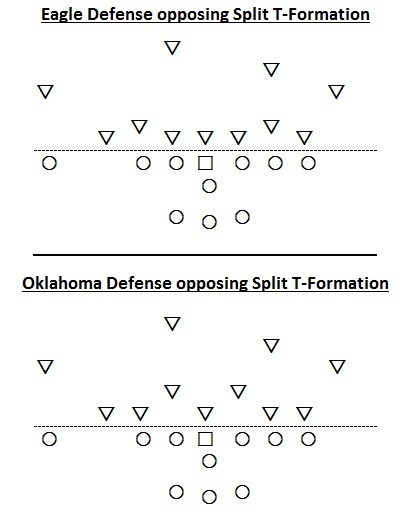 Agajanian’s role was refined to handling only field goals and point-afters. During his final year with New York in 1957, Agajanian kicked the franchise’s first 50-yard field goal. The fourth quarter kick on October 13 not only broke Strong’s 17-year old record for the Giants longest field goal, it proved to be the longest field goal ever made in Washington’s Griffith Stadium. Agajanian retired to the West Coast after the season. He left the Giants with two team records aside from the longest field goal: the most point-afters with 160 and the most consecutive point-afters with 80. Agajanian was New York’s third highest career scorer with 295 points, after Strong’s 351 and Cuff’s 319. 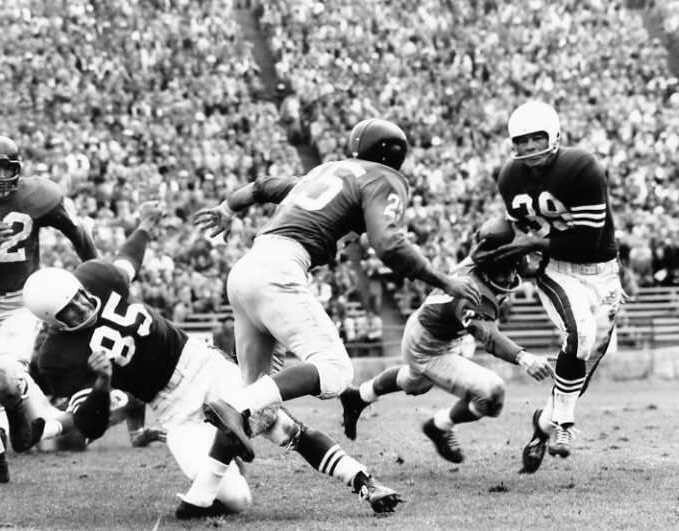 Agajanian was again lured from retirement, this time by the Los Angeles Chargers in 1960. 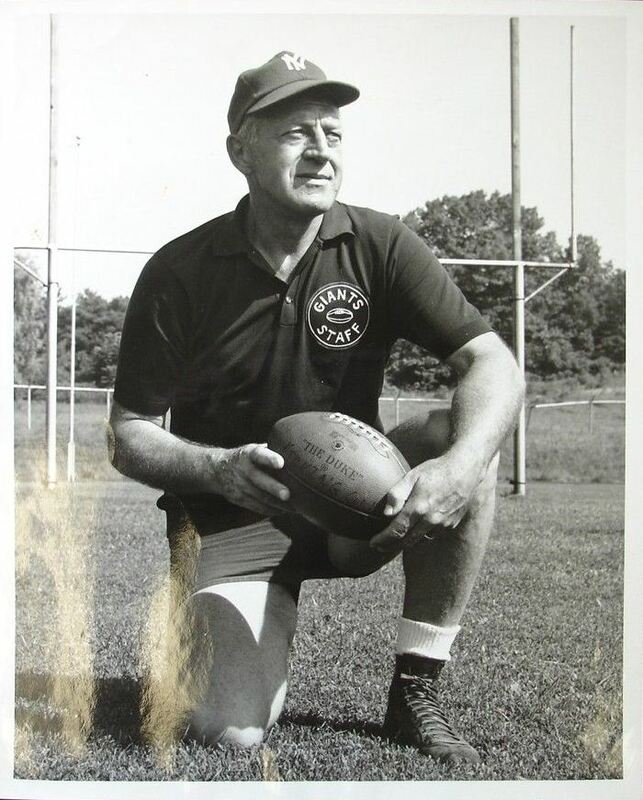 He kicked for five more teams until retiring for good in 1965, where he then embarked on a long coaching career. There have been several earnest attempts to get Agajanian elected to the Pro Football Hall of Fame in recent years, but he has yet to receive the honor. There were big shoes to fill following Agajanian’s departure. It was appropriate that they were filled by another kicker who wore a square-toed cleat. Pat Summerall was born with his right foot backward. Doctors performed an operation where the foot was broken, turned around and reset. It seemed unlikely that Summerall would become pro football’s first universally-celebrated kicking specialist when he was included in a trade with defensive back Linden Crow between the Chicago Cardinals and the Giants. Summerall was a two-way end who also had some kicking ability, but was erratic. He had never had a season where he converted 50% of his field goal attempts and often missed point-afters. 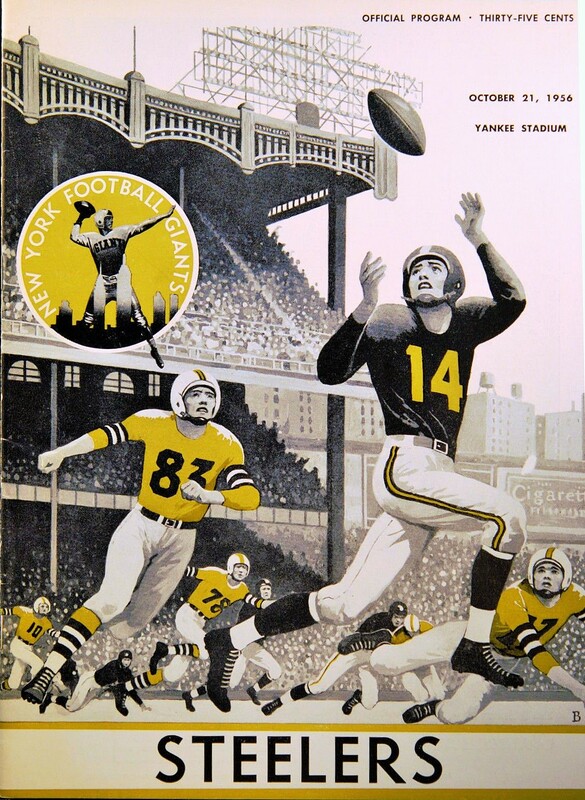 Summerall’s first climactic field goal served as an overture for New York’s now legendary 1958 season. 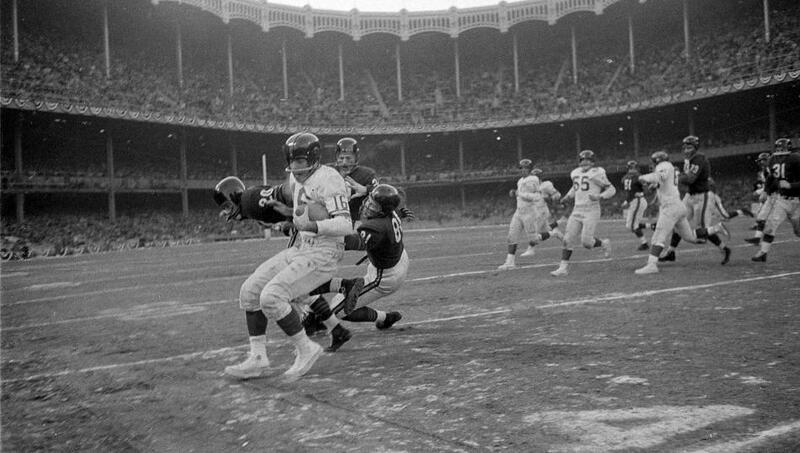 At Yankee Stadium on November 9, the Giants engaged in a back-and-forth battle with the Colts, who were without Johnny Unitas. Having just yielded a touchdown that tied the game 21-21 in the middle of the fourth quarter, the Giants advanced. A mix of Gifford rushes and Conerly passes set the ball, 4th-and-3, at the Baltimore 21-yard line. The snap and placement were imperfect, but Summerall delivered. “When I saw the laces were facing the right sideline I knew I had to kick the ball a little to the left,” said Summerall. “The ball always fades to the side with the laces.” The kick went through at 2:40 and the Giants defense held on for the win. This just set the stage for the dramatic season finale on a snow-covered field against the Browns (story here). Summerall had one of the great seasons for a kicker in 1959. He had five games where he kicked three field goals, including a 9-3 win over the Cardinals where he accounted for all the Giants points. He also had another occasion where he was relied upon to finish a come-from-behind surge. On September 23 at the Los Angeles Coliseum, New York trailed the Rams 21-17 entering the final period. Summerall’s 14-yard field goal cut the lead to 21-20 with 13:30 left to play. The teams traded punts for the rest of the period before the Giants began their final advance. 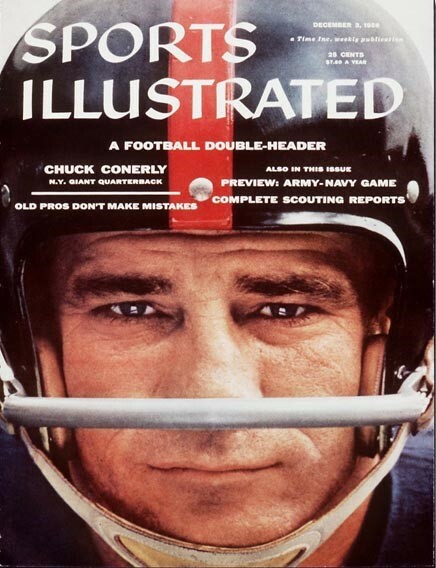 Conerly passed New York to the Los Angeles 11-yard line where the drive stalled with under two minutes on the clock. Summerall was good on his 18-yard attempt and the defense preserved the 23-21 victory. In 1959, Summerall became the first Giant to lead the NFL in field goals (20) since Strong in 1944. He also established a team record with 90 total points by a kicker. Summerall’s final season in 1961 saw him set a new franchise mark with 46 point-afters, of which the final 129 point-afters were made consecutively without a miss. As is their tradition, the Giants looked to the familiar as they embarked upon a new era. Strong was brought in to mentor Chandler and Jerry Hillebrand during training camp. Typically, the straight-ahead kicker would line himself up approximately one-and-a-half yards behind the holder. On the approach, the kicker would take a short step forward with the kicking foot, a long, hopping step with the plant foot to generate forward momentum, then swing the kicking foot at the ball with the ankle locked and the foot in an upward facing position. As punter and kicker, Chandler helped to save one of the Giants 36 roster spots. But he did more than that as his success as a kicker was both immediate and profound. He tied the Giants record for three field goals in a 29-13 win at Franklin Field in Philadelphia on September 23. In the rematch with the Eagles at Yankee Stadium on November 18, Chandler eclipsed the record when he made four field goals in a 19-14 win. Chandler kicked four more field goals in the Eastern Division clinching 26-24 win at Wrigley Field against the Bears. 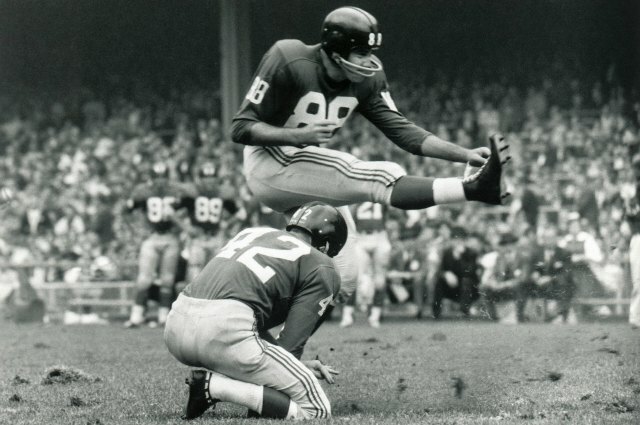 Chandler became the first New York kicker to surpass 100 total points with 104 in 1962. He set a team record with 47 point-afters and added 17 field goals. As impressive as those marks were, they did not last long. In 1963 Chandler had 106 total points on 18 field goals and 52 point-afters, a franchise standard which still stands today. Chandler slumped in 1964 after his back-to-back great seasons. He missed more field goals than he made and totaled just 54 points. After the season, Chandler requested a similar travel allowance for 1965 that had been granted Agajanian in the past. Chandler wanted time during the week to be at home in Oklahoma to attend his insurance business. Instead he was traded to Green Bay. The Giants kicking situation in the 1965 season was an unmitigated disaster. Four players combined to convert four field goals in 25 attempts – a 16% success rate that wouldn’t even be considered adequate in the 1920’s. The step New York took to rectify the situation was a bold one, and it changed pro football forever. However, Gogolak was not the first sidewinder in football. There were a handful of college players with a soccer background (as did Gogolak) in the late 1950’s and early 1960’s who experimented with the style, but they were mostly regarded as an eccentric curiosity and none advanced to the pro level. Contrary to popular belief, Gogolak was not the first player to change leagues. In 1961, end Willard Dewvall left the Bears and signed with the Houston Oilers, but that move received little attention as Dewvall was not a player of Gogolak’s stature. Also, a player leaving the established NFL to an upstart league was not a new phenomenon. Many NFL players jumped to the AAFC in the 1940’s and to the Canadian Football League (CFL) in the 1950’s during bidding wars. 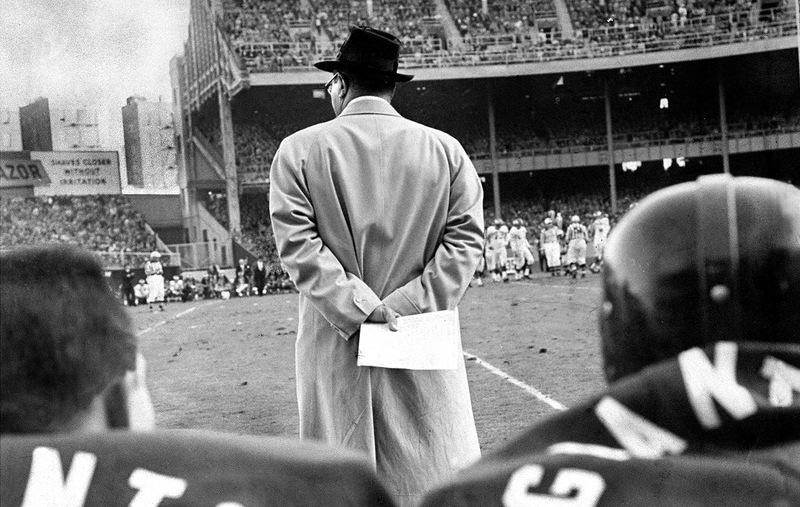 The 1960’s NFL was still dominated by owners who had survived the hardships of the Great Depression and World War II by being frugal. But this unprecedented transaction of the NFL taking a player from a rival league at a significantly higher salary implied an acknowledgement of legitimacy toward the AFL. A future movement toward integration had become inevitable. Political and business implications aside, Gogolak’s contributions to the game on the field are no less important. He was clearly a different breed. During practices he was segregated from the rest of the squad, and used a soccer ball as well as a football during warm ups. As a pure specialist with no other positional responsibilities, he admitted he often felt like an outsider. “It’s the way it’s always been for me,” he said. Head coach Allie Sherman was unconcerned. “He knows what it takes to get ready, that’s good enough for me,” said Sherman. Part of his routine was refining the “touch” he felt was required by his craft, rather than lifting weights and running drills as other kickers in the past had done. Gogolak differed from contemporary kickers physically as well. He had a small frame that some perceived as frail. They thought he might be snapped in half if he ever attempted to make a tackle. Plus nobody understood how a little guy like that would be able to kick a ball as far as a larger man like Lou Groza, who had been an All-Pro tackle for the Browns early in his career. Initially, scouts and coaches were skeptical of Gogolak and those who soon followed his path. Many doubted that these smaller men would be able to hold up over the course of a season or meet the demands of kicking off and making long-range field goals. In the traditional straight-ahead kicking style, with the toe of the kicking foot strikes the ball, the velocity behind the launch comes from the strength of the kicking leg, specifically the quadriceps muscle. This in part explains why larger men were successful at straight-ahead place kicking. It required minimal mobility in the direct approach to the ball, and it maximized their power potential. The sidewinder approach (today known as soccer-style) offers two differences that over time became recognized as advantages: surface area and angular momentum. Gogolak explained his sidewinder style as being analogous to swinging a golf club. The sidewinder contacts the ball with the instep of his kicking foot. This gives him more ability to control the initial trajectory of the ball as it leaves his foot, a desirable effect when kicking through the wind. He also is afforded more margin for error in the event of a mis-strike or a last second adjustment if there is an errant snap or unstable hold. This explains the sidewinders’ superior accuracy. The greater range might initially seem like a paradox, but it too is grounded in physics. The power originates from the torque created at the hip socket. This is where the golf club analogy applies. As the sidewinder approaches the ball from an angle, his first step toward the ball is with his kicking leg. His second step is a long stride with his plant leg. As the plant foot is set, the hip of the kicking leg is fully opened (externally rotated) with the knee deeply bent and the heel of the kicking foot pulled back. As he swings the foot toward the ball, the hip closes as the knee straightens, creating tremendous angular (or rotational) momentum from the full weight of the leg directed at the ball. This phenomenon is termed foot velocity. With the increased surface area of the instep contacting the ball, the impact creates more force being directed into the ball. More directional control also creates more potential power. More muscle mass would ultimately detract from a sidewinder’s kicking ability. A minimal amount of strength is required; mobility and flexibility are maximized with this style. Superior kicking ability did not often translate to more wins for the Giants during Gogolak’s tenure. 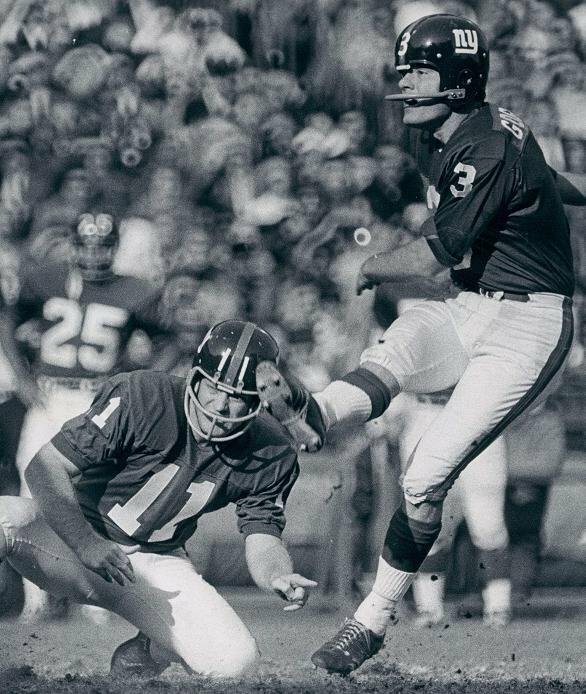 Gogolak has more games played than any other Giants kicker, is the Giants all-time leading scorer and is first in the categories of point-afters and field goals made. Yet, he has only two game-winning kicks to his credit. The Giants teams of his era ranged mostly between mediocre and terrible. Regardless of the team’s performance, Gogolak’s impact rippled through pro football quickly. After his first season in New York, his brother Charlie Gogolak was signed by Washington and Jan Stenerud by Kansas City. The sidewinder style of place kicking had taken root and in less than 10 years the straight-ahead style would be rendered near obsolete, with only a few aged veterans lasting into the 1980’s. All the kickers coming up from college used the new approach and were highly effective. Gogolak was inducted into the Army in 1967, but was granted dispensation to have the weekends during the season off duty to play for the Giants. Once out of the Army in 1969, New York experimented with him as a dual specialist, as Chandler once had, as both the punter and place kicker. Gogolak’s kicking accuracy declined. After a Week 2 loss in Detroit where Gogolak missed two field goals, he was relieved of punting duties and New York spent the year rotating four different players at punter. Tom Dempsey, a straight-ahead kicker for New Orleans, kicked a 63-yard field goal at Tulane Stadium on the game’s final play for a 19-17 win over Detroit on November 8, 1970. His record was considered unbreakable for many years. It was not tied until 1998 and was eventually eclipsed by one yard in 2013. In 1970, Gogolak broke Summerall’s team record for field goals in a season when he connected on 25 attempts. He also recorded his first game-winning field goal when he broke a 24-24 tie at RFK Stadium with 1:52 to play for a 27-24 win over the Redskins on November 29. During the 1972 season, his running streak of 133 consecutive point-after conversions came to an end. It was a franchise record and the fourth longest streak in pro football at the time. He also set a team record with eight point-afters in a 62-10 win over Philadelphia at Yankee Stadium on November 26. Gogolak had another game winner that season in Yankee Stadium against the Cardinals, but his most pressure-packed kick came the next year in a game the Giants did not win. It was also the franchise’s last appearance in Yankee Stadium. Gogolak received the ultimate acknowledgement from the NFL prior to his final season in 1974 – they adopted new rules in attempt to minimize the soccer style of kicking he brought to pro football. The goal posts were returned to their pre-1933 location on the end line. Now that the hash marks were lined up with the uprights, field goals were becoming too commonplace and it was deemed necessary by the rules committee that the degree of difficulty needed to be increased. This was also true for kickoffs, which were moved back from the 40-yard line to the 35 to reduce the number of touchbacks. After a 1974 season where his percentages dipped, Gogolak was released by the Giants during the 1975 training camp in favor of the younger, and cheaper, George Hunt. Gogolak said the rule changes did not directly affect his on-field performance, and that he had opportunities to play for other teams. But he said if the Giants cut him, he would simply retire and pursue the next phase of his career, rather than continue football. The straight-ahead style of place kicking officially came to a close when Mark Mosely retired from the Browns after the 1986 season. The last straight-ahead kicks in the NFL occurred on September 13, 1987 at RFK Stadium. The Redskins starting kicker Jess Atkinson was injured during a first quarter point-after attempt. He was relieved by punter Steve Cox, who sometimes substituted on kickoffs and long range field goals. Kicking straight ahead, Cox was three-for-three on point afters in the game and also added a 40-yard field goal. Every field goal and point-after in the NFL has been made with the sidewinder approach ever since, including Dough Flutie’s drop kick point-after made on January 1, 2006. Flutie used a never before seen hybrid technique on the attempt. After receiving the snap, he used the traditional three-step approach to the point of the kick, but did so diagonally and booted the ball over the crossbar with his instep. It was the perfect blend of Thorpe and Gogolak. The kicking game, for one poignant moment in time, had come full circle.